Although you may not be aware of it, it’s likely you’ve engaged in one or two dark social acts in your time. Remember the other day when you messaged your friend a link to a pair of shoes you knew she’d love? Gotcha. Dark social refers to traffic to your website that cannot possibly be accurately tracked – usually because it comes from social messaging such as WhatsApp or Facebook messenger. 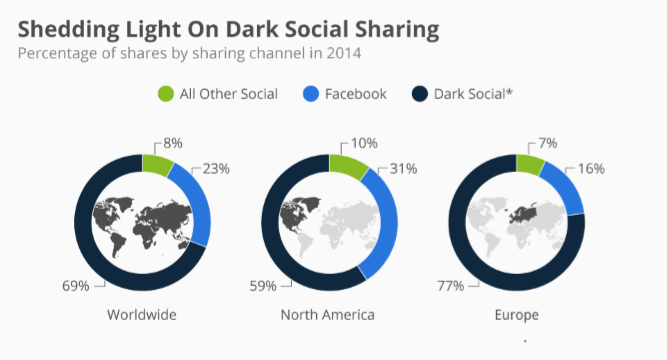 Reports suggest that not only does dark social account for up to 74% of all online sharing activity, but also that it has now overtaken sharing activity on Facebook (RadiumOne). What’s more, 26% of people admit to only sharing in the dark meaning you could be blind to the behaviour of up to a quarter of your most valuable customers. In simple terms, many brands aren’t seeing the whole picture when it comes to their analytics. Whilst your monthly Google report may tell you that 23% of your traffic came direct to your site, what it won’t tell you is how many of these people accessed your site via a Facebook message their friend sent them.In even more simple terms, you could be wasting your time and effort reacting to analytics that are fundamentally flawed. What can you do to overcome it? On your analytics platform you could create a segment that excludes this ‘dark social’ traffic from your direct traffic. For example, it is highly likely traffic to a homepage has come direct from a user typing the address into their address bar. Traffic to specific pages such as articles are unlikely to be direct traffic unless a user has saved the page in their bookmarks or favourites, so we can conclude that a large percentage of this traffic is from dark social. The lesson here? Dark social is only going to get bigger and the sooner you realise it’s power, the sooner you can do something about it. For advice on creating segments in Google Analytics click here.